Patagonia is cold and windy – don’t get me wrong, I know that, but Oh Boy did she bring out the welcoming committee for us on our last trip! 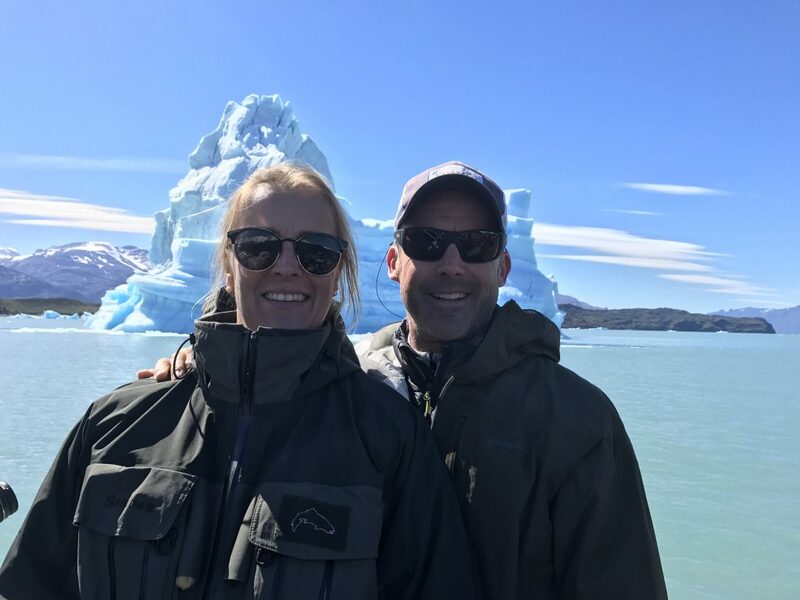 Our group kicked off with a tour of the Perito Moreno Glacier National Park the day before heading off to Estancia Laguna Verde Lodge, blue sky and cool weather not too bad we thought. The following day arriving at the Lodge, the Laguna below looked like something out of Armageddon with white horses not out of place on the North Atlantic. Heading down to Lake Stroble (Jurassic Lake) the vehicles were buffeted in the wind as each guide made their way to the pre-allocated bays that would provide some shelter from the elements. It was tough, no doubt! 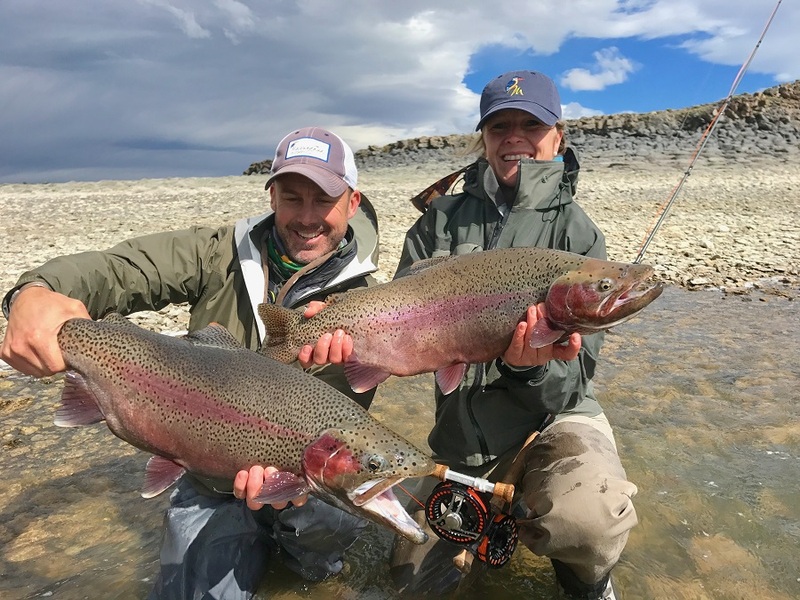 Thing is – it’s a nice tough……like a pain and pleasure kind of a thing, your hands freeze because they’re constantly wet in that wind holding and releasing monster fin perfect rainbows one after the other! 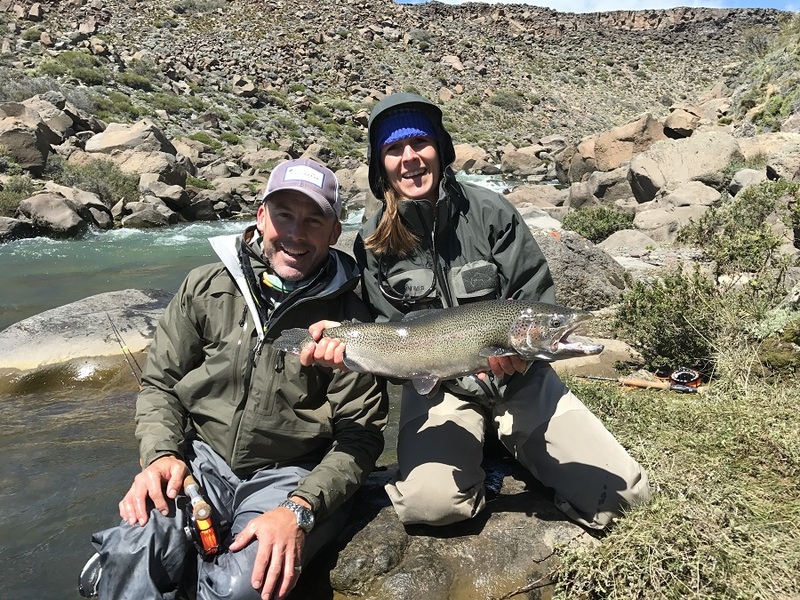 I was lucky enough to be fishing with my wife Sarah – after she would land a fish she would “jog” elegantly up the hill in her waders and photograph flowers and the vistas, my technique was little less refined, head for the guides truck, put the heaters on full and chug a glass of Malbec. The result – Sarah’s photography was magnificent and my afternoon fishing becoming ever less effective! As always the huge 15 km plus stretch of river was amazing, mousing to aggressive 15-pound fish at your rod tip in pools you could wade across. 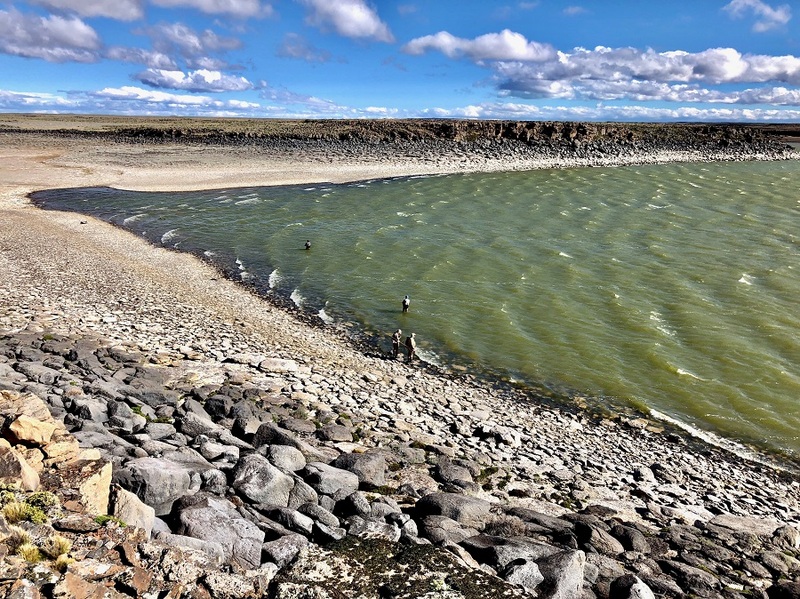 The numerous Lagunas on the estancia each with their own characteristic topography, clarity and food chain providing a diversity of fishing from figure of eight scud fishing by feel in the choppy shoreline to being perched up high and spotting cruisers, trying to present a dry and dropper with wind so vigorous you were lucky to make the presentation within 10 feet of the cruising beast below! Was a double now a single! The Long Haired General and I wanted to tick a couple of boxes, a photograph of two lake fish over ten pounds and two river fish over 8 pounds. We didn’t manage the latter, usually I am fairly vocal with instruction on holding fish properly, but while repositioning my hands around the tail of a stunning 12 pound river fish for our double photograph I dropped it into the water – as you can imagine I will be reminded of that faux pas for years to come…..!